Welcome to the womens medieval and renaissance costumes section, where we are Medieval Collectibles are proud to offer you dozens of potential costumes to fulfill your impending dress-up desires. Because there is so much to be found within the medieval times and the renaissance period, you will find our broadest assortment of costumes available in our womens medieval and renaissance costumes section: princess costumes intermingle here with warrior costumes; roman costumes stand alongside costumes fit for renaissance royalty; Grecian goddess costumes wait alongside tavern wench costumes it is nothing short of shear costume chaos! Here, in the womens medieval and renaissance costumes, you will find costumes that will transform any woman into a wide variety of things, be they mundane or mystical in nature. So whether you want to be something as whimsical as a forest faerie or a mystical sorceress or something a little more down-to-earth, like a barbarian woman or a noble princess, you will find that costume here. With such an amazing selection of costumes, one here will certainly be just what you need to transform yourself just-in-time for Halloween or for any costumed event that has need of a gladiator, sorceress, mythological figure, bandit, princess, barbarian, or queen. No need to go falling down rabbit holes in search of the perfect costume! 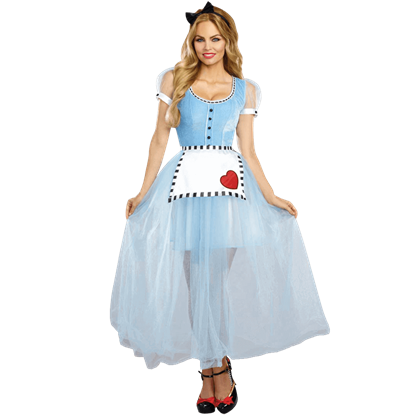 This Alice Womens Costume will have you searching for a tea party with fancy hats, a croquet game with a queen, or a lively game of chess with noble knights. If you live by the words -All for one and one for all-, then there is only one role you should take this Hallows Eve. Combine your skills in swordplay and fashion with the All for One Musketeer Costume to clothe your noble soul. Glamor, power, and darkly attractive appeal are all things that evil queens often have in spades. If evil is all in the attire, then this Alluring Evil Queen Womens Costume will turn the nicest girl into the darkest fantasy femme. You will look like a warrior fit for battle in this Amazone Costume. And even better, in this costume, you can retain the look of a beautiful and powerful woman, one more than capable of facing down any foe on the field of battle. Dance gracefully across the ballroom floor in the arms of your prince. 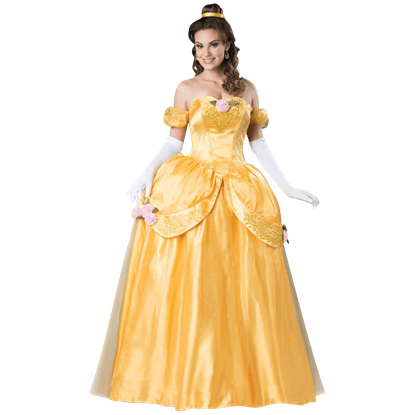 The Beautiful Princess Deluxe Adult Costume is a perfect fit for the lovely maiden whose kindhearted spirit holds the key to unlocking the heart of a beast. A corset is a common staple in medieval wear, often being seen on women from various stations, ranging from nobles to criminals. This Black Medieval Corset is great casual corset that is perfect for wenches and pirates of all sorts. Shiny and stretchy, the Blue and Red Booty Shorts are great for adding a dash of sass to your costume. Made of a poly-spandex blend fabric, you can dare to wear them on their own, over tights, or for modesty underneath a short skirt. A corset is a common staple in medieval wear, often being seen on women from various stations, ranging from nobles to criminals. This Brown Medieval Corset is great casual corset that is perfect for wenches and pirates of all sorts. Slay the Big Bad Wolf with your sultry style when you step into the woods wearing the Captivating Miss Red Costume. This kit includes a short and sassy take on a medieval maiden gown accompanied by a long, satin texture hooded cape. The toga was the common attire of the day during the Roman era. 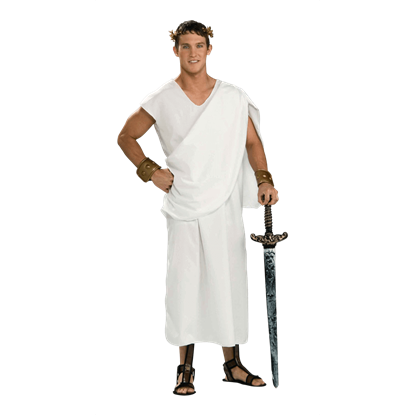 This versatile garment was worn by virtually every citizen of the Roman Empire, and now, men and women of the modern day can enjoy it too by wearing this Costume Toga. 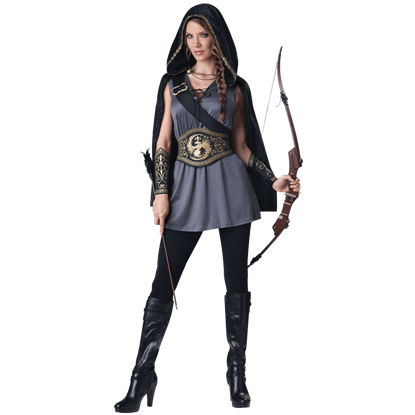 Sleek, stunning, and stylish are three very good words to describe this Dark Huntress Women's Costume. It features an iconic touch of fantasy style, while possessing a flattering and fun design that typifies a truly great costume. With a crafty gleam in her eyes and a gentle smirk on her lips, the sorceress watches the king drink from the goblet. Arrayed in the Dark Medieval Maiden Costume, she awaits the moment when her magical concoction takes effect.